During the time of the Civil War, Nodaway County seemed to have conflict from each side. The war did not drastically hurt the agriculture industry. Nodaway County resides in the northwestern region of Missouri close to the “Old Platte Purchase”. Maryville hosted the county seat. The three principal towns after the Civil War were Maryville, Graham, and Hopkins. The county was well watered by the One Hundred and Two River and the Platte River. The land consisted of two/thirds prairie, and one /third timber. The prairie land was a clay loam soil. The County reporter bragged that there “was not a single quarter-section in the county that is not susceptible of agriculture improvement or from which an industrious farmer could not make a livelihood.” Trees common to the area were the black walnut, white and red elm, mulberry, hickory, hackberry, cottonwood, soft maple, burr, spotted, red white and pine oak trees. In 1870, an estray notice taken out of the Nodaway County Democrat stated that a bay mare was found and appraised for a selling price if the owner did not claim her. In 1871, Nodaway County consisted of 559, 051 acres worth approximately $3,899,084. It also contained 1, 368 town lots. In the early 1870’s, Nodaway County housed about 9, 595 head of horses, 1,072 mules, 31,306 head of cattle, 16,894 sheep and 44,950 hogs. The value of the livestock was estimated at $1,538,000. In terms of crops, 43,600 bushels of spring wheat averaged about 12 bushels per acre; 8,000 bushels of winter wheat, averaged about 20 bushels. 2,550 bushels of rye averaged about 20 bushels also. 1,351,420 bushels of corn averaged about 35 and 1500 bushels of barely was produced that averaged about 25. 259,140 pounds of butter was estimated of being produced in Nodaway County. About 114,876 pounds of potatoes and 15,000 pounds of cheese were also produced. Approximately 18,859 tons of hay averaged about 2 tons with Timothy and Clover as the major hay crop. 15, 244 gallons of sorghum molasses and 5,080 pounds of honey were also estimated. The estimated value of all these crops was nearly $1,530,000. This information was collected in 1870. Nodaway County’s population was around 16,000 at the time. Most were immigrants from Germany and the middle states included: Ohio, Illinois, Wisconsin and New York. The increased rate was 1,000 to 1,500 per year. The livestock increase was larger than the human population with the exception of sheep. The decrease was caused by foot rot and scab. Nodaway County suffered the loss of some 2,000 head of sheep. Scavenger dogs were also to blame for the loss of sheep. Spring wheat was destroyed by chinch bugs in 1870 but all the other crops increased in yield. The cost for unimproved land sold between $5 and $10 an acre. The Missouri Valley Railroad was the only completed railroad at that time. In 1872, improved land sold for $10 to $25 an acre whereas unimproved land still sold for between five and ten dollars and acre. Land had increased in value by 200 per cent since the war. In the county, there were 9 water ways, 11 saw mills, one wool factory, one wagon and carriage, two furniture factories, one cheese plant in Pickering which uses about 300 cows used for milking. Then cheese took first premium at the St. Louis Fair in 1872. A fence cost about one dollar per rod and it cost about 10 cents a year for maintained of the fence. Fruits in Nodaway County included apples, cherries, grapes, pears and peaches. Wine had not been made at that time; however J.M. Black and William Stewart of Maryville had been raising a lot of grapes. 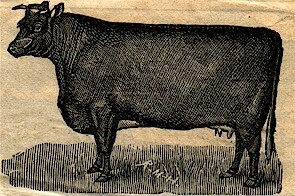 The markets went to St. Joseph and Chicago, at the time cattle went for one half of the cattle population and about one-tenth of the hogs were shipped there. At the end of the war, about 5,000 people lived in Nodaway County. Two weekly papers, ten churches, two private and 127 public schools were present in the county at the time of 1872. The County Agriculture and Mechanical Society was also organized at that time. In 1874, the recorder for the County in 1874 mentioned that the soil was “very productive.” Timber was abundant for fencing although the timber was starting to become scarce because of the many settlers. In terms of crop production, most yields were concurrent with the other previous years although corn and potatoes were decreased in production by half. Little tobacco was raised but what was raised was successful. Cereals and vegetables were raised and produced high yields. In 1874 there were not any stock laws. Majority of Nodaway County citizens did not want free roaming livestock even though the prairie grass was abundant. There were approximately 223,900 acres worth about $20.00 per acre in 1879. Raw lands, timber and prairie land was worth about three to ten dollars per acre. About 330,000 acres were not cultivated. Exports included hogs, cattle, mules, sheep, horses, wheat and corn. There were approximately six high schools, 160 public schools and four private seminaries. Farm animals for Nodaway County included cattle, mostly Durham, three types of sheep, hogs of all breeds and horses. There were about 2,000 bee cultures. Maryville’s population was close to 3,500. Hopkins’ population was about 1,400, Graham 400, Barnard 600 and Clearmont 500. Banks in Nodaway County consisted of; Nodaway Valley, Farmers Bank, Hopkins, Bakers, and Sanders & Company. The four newspapers at the time included; The Maryville Republican, Nodaway Democrat, Greenback Standard, Hopkins Journal and the Barnard Times. In 1879, Nodaway County held their annual fair on September 9. $3,500 was offered in premiums and the amount paid in premiums reached about $2,908.35.